Alchemy Coach fosters positive reinforcement through on-the-floor "observations." Supervisors can use Alchemy’s pre-built observations for coaching on safety, GMPs, and SOPs — or create your own site-specific observations. Training is just the beginning. Alchemy Coach helps supervisors verify that training is applied correctly. Coach digitally documents behavior and corrective actions — including photos and employee sign-offs. Reinforcement makes training stick. Field research shows a combination of training with coaching observations improves employee compliance to standards as much as 38%. Say good riddance to hard-to-manage paper records. Alchemy Coach digitally documents observations — with employee sign-offs on corrective actions — and automatically stores it in the cloud for easy search and retrieval. What happened on the floor last week is no longer a mystery; it’s at your fingertips. Set your supervisors up for success. Not every team leader feels comfortable with one-on-one communication — especially when correcting behaviors. Alchemy Coach provides simple structured conversations, which can be extra helpful for newer leaders. Coach builds confidence in supervisors that funnels down to the entire team. Studies show workers who feel valued are more likely to remain in their jobs. Alchemy Coach observations foster dialogue between employees and supervisors that improve employee performance and retention. Your supervisors are the link between management and frontline workers. 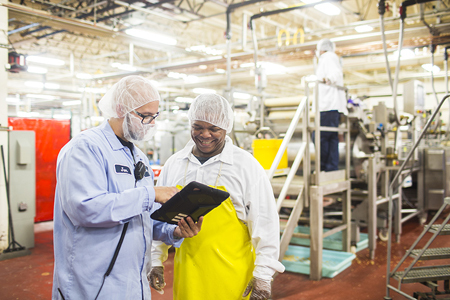 Use structured observations to ensure all employees are following safety and operations procedures across all lines, shifts, department, and plants.